Due to readiness requirements, military personnel are capable of rapid response to a broad spectrum of emergencies. 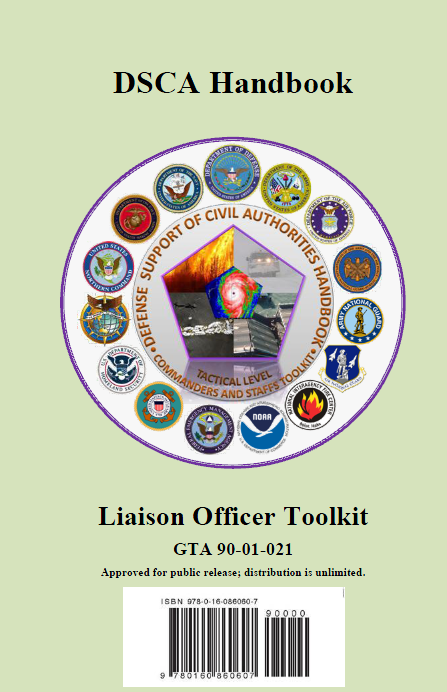 Because military personnel and their associated equipment can often be effectively employed in civil support operations, civil authorities continue to call upon the military for assistance. The Federal Emergency Management Agency (FEMA), under the direction of the Department of Homeland Security (DHS), is the Primary Agency (PA) in the federal response to natural disasters. DoD resources, in coordination with FEMA, may be requested to augment local, state, and federal capabilities in assisting with a state-led response. An exception is wildland firefighting, in which case the National Interagency Fire Center (NIFC) is the PA. 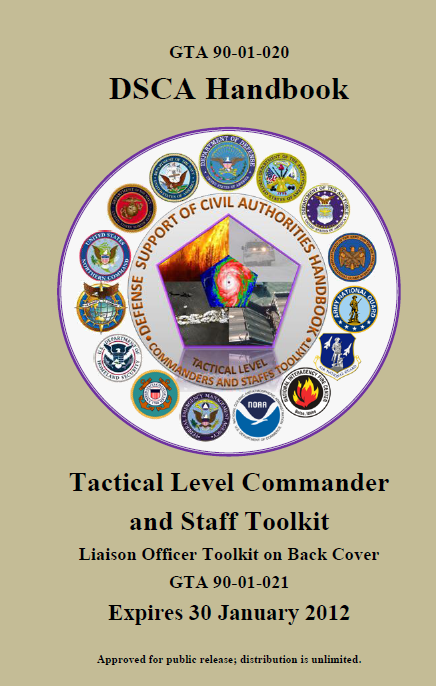 This handbook has been developed primarily to support DSCA operations in the Area of Responsibility (AOR) of United States Northern Command (USNORTHCOM), including the 48 contiguous states, Alaska, Puerto Rico, and the Virgin Islands, and the AOR of United States Pacific Command (USPACOM) including Hawaii, Guam, and American Samoa. 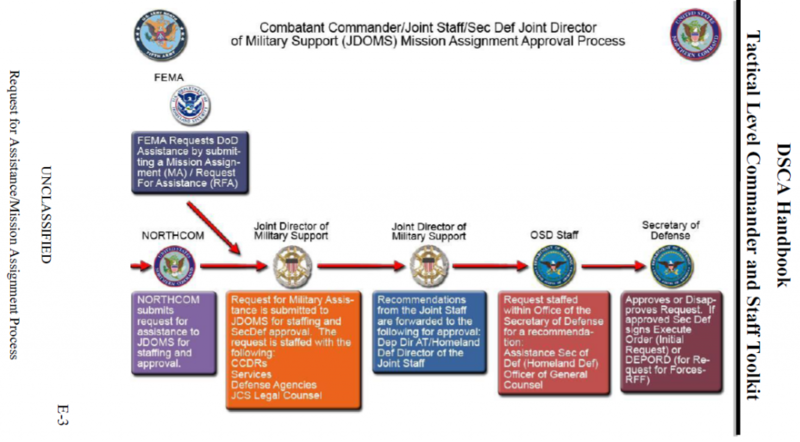 Specific references to USNORTHCOM in this document are not intended to exclude USPACOM. Military forces have the right and responsibility to protect themselves and their assets at all times. State military justice laws, for Title 32 and SAD, and the Uniform Code of Military Justice (UCMJ) for Title 10 and are always in effect for military personnel. Most physical security and critical infrastructure protection activities are performed by non-military organizations, often involving Memoranda of Understanding (MOUs) with the local civilian law enforcement authorities. The most likely use of the military is through the local National Guard forces. However, there is a process to receive federal aid. CIKR-related preparedness, protection, response, and recovery activities operate within a framework of mutual aid and assistance. Incident-related requirements can be addressed through direct actions by owners and operators or with government assistance provided by federal, state, tribal, or local authorities in certain specific circumstances. The PCA impacts all federal forces by prohibiting them from performing any law enforcement actions, including directing traffic. Consequently, federal military forces may not direct traffic in a civilian jurisdiction unless it is to help military vehicles/convoys that need to arrive at a destination quickly in order to perform an urgent mission, and to move through an area unimpeded. In these unique situations, federal military forces rely on the Military Purpose Doctrine exception to the PCA. The National Guard may direct traffic, in accordance with state law. This may seem like a trivial point, but it can cause unnecessary legal problems if not handled correctly. All DSCA operations have the potential for civil disturbance. How civil disturbance is handled will depend upon the specifics of the incident and must have Presidential approval. (For more details see Section 2.1.4.2). However, federal military commanders may exercise emergency authority in civil disturbance situations as described below. In these circumstances, federal military commanders will use all available means to seek specific authorization from the President through their chain-of-command while operating under their emergency authority. 1. The use of federal military forces is necessary to prevent loss of life or wanton destruction of property, or to restore governmental functioning and public order. Under these conditions, emergency authority applies when sudden and unexpected civil disturbances occur, if duly constituted local authorities are unable to control the situation and circumstances preclude obtaining prior authorization by the President. 2. Duly constituted federal, state, or local authorities are unable or decline to provide adequate protection for federal property or federal governmental functions located in the area of the civil disturbance and circumstances preclude obtaining prior authorization by the President. Federal action, including the use of federal military forces, is authorized when necessary to protect the federal property or functions. Theft of property/supplies—leaders organize a riot as a way to disrupt security surrounding logistics control points, with the objective of seizing guarded property. Political purposes—riots are often organized for propaganda or to embarrass the government. Grievance protests—a grievance protest can be organized as a riot. Under normal circumstances, this type of riot is not extremely violent in nature. It may turn violent when leaders try to exploit the successes of the riot or the weaknesses of the security force. Unorganized riots: Unorganized riots are spontaneous, although they can be exploited and diverted by leaders into different types of riots. They are usually indicative of extreme frustration and fear. Under determined leadership, the pattern of these gatherings can change to an organized riot. Once a riot begins, it can spread to other areas and become entrenched in several different key locations. The Constitution of the United States and federal statutes authorize the President to direct the use of armed federal troops within the 54 states and territories and their political subdivisions. The President is also empowered to federalize the National Guard of any state to suppress rebellion and enforce federal laws.